Gusty winds blew across the bench above the river where we were camped last night at Rattlesnake Bend. They swirled around unpredictably and I slept with one eye open wondering if one of the big limbs belong to the fir tree sheltering my bivy sack was going to come crashing down. When I wasn’t thinking about the possibility of incurring an injury while sleeping, I was wondering if the wind would be blowing upstream in the morning and thus negating the effects of our paddle strokes as we exited the Smith River canyon and paddled the remaining 12 miles of slow river through pastureland en route to Eden Bridge. In contrast to our first two nights on the river which were characterized by cold temperatures and dew, last night the thermometer barely dipped below 60 degrees F, and we stayed dry. I spent most of the night with my pound-and-a-half synthetic quilt scrunched down into the bottom of my bivy sack. I woke up to see the sun begin to kiss the yellow tops of the cliffs on the east side of the river. I rubbed my eyes which were encrusted with dry goo and blew what seemed like a pound of snot out of my nose. It seemed that the wind wreaked a bit of havoc on my allergies last night. After regurgitating the phlegm sitting in the back of my throat, I exiting my bivy sack to begin the process of getting psyched to paddle in the wind. That process began with a cup of coffee. We spent the morning paddling through the last three or so miles of the Smith River canyon and bid adieu to the high limestone walls. Fortunately, the wind that had plagued us for the past 12 hours was prevailing from the southwest – we had a tailwind today. The scenery remains grandiose for the next several miles, but just in a different way. We passed an ancient, decaying homesteader cabin, an occasional irrigation drawpipe and pump station, and a rusty piece of old farm machinery. Remote, uninhabited pastureland gave way to a few barns, farmhouses, and a ranch bridge. A rancher riding across the bridge on an ATV waved to us with a curious look as we bobbed by in our packrafts. Barren pasturelands gave way to cottonwood bottoms and we paddled over, through, and around an increasing amount of wood in the river – a minor hazard only, but one that we hadn’t dealt with for the first 50 miles of our float. Upon reaching Eden Bridge, we unwound on the grass in the barren parking lot – a strange experience in and of itself – what a treat to have had this river to ourselves. I suppose that any wilderness experience is made up of the complex dynamics between place and people. Place, of course, changes with the season, prevailing weather, stream flow, wildfire, and a host of other environmental characteristics. The expedition party, as well, is a dynamic unit that depends on the number in the party, the participants, the general stage of life they are in, the emotional season they are going through at the moment, and a host of other known – and unknown – factors that contribute to the complicated thing we call humanity. Marry the dynamics of humanity with the seasonality of a place, throw in a bit of uncertainty, and lean in to the anticipation of an impactful experience – and you have everything you need for a perfect four days in the wilds. 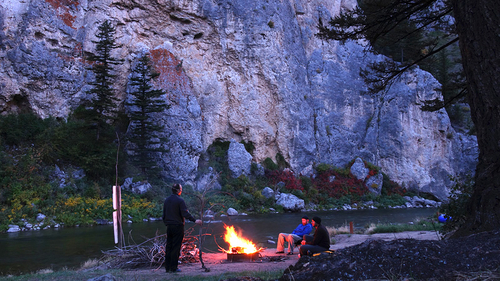 Photo: Evening campfire at Rattlesnake Bend, Smith River, Montana.